Social isolation is a growing issue among older people in the UK, with research showing that social isolation can lead to a higher risk of death. 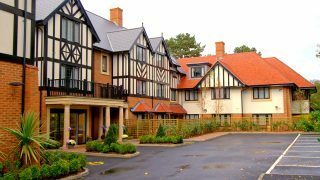 There is a close relationship between loneliness, social isolation and living alone, which can be combatted with regular social activities – something that is encouraged at Hallmark Care Homes. 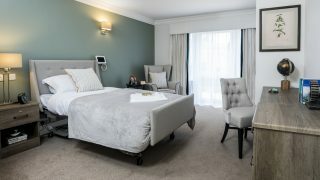 To see what effect living in a care home had on reducing social isolation, we surveyed our customers, and found that not only did residents take part in social activities much more regularly once they moved to a care home, their happiness levels also improved dramatically, showing a reduction in social isolation. 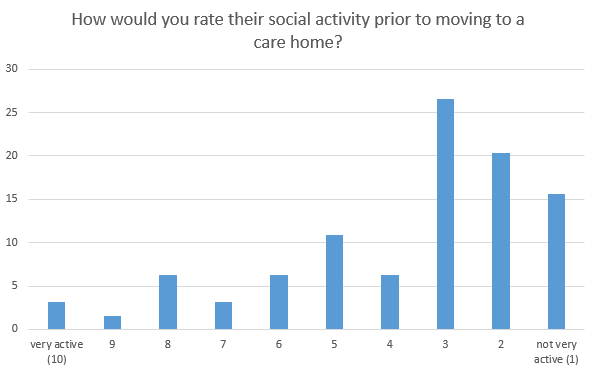 The Hallmark Care Homes survey was conducted by asking the children and relatives who referred their loved ones to the care home to answer questions on their behalf, rating their experiences both before and after moving in. 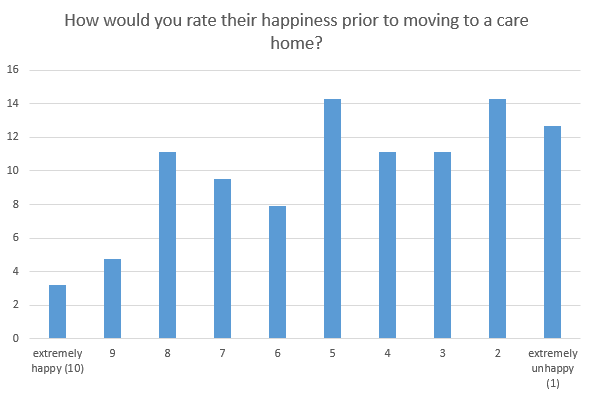 The survey covered the resident’s living situation prior to moving in, how often they were visited by family, friends and carers, what social activities they took part in and how often, as well as asking for a rating on their happiness at the two points in their lives. 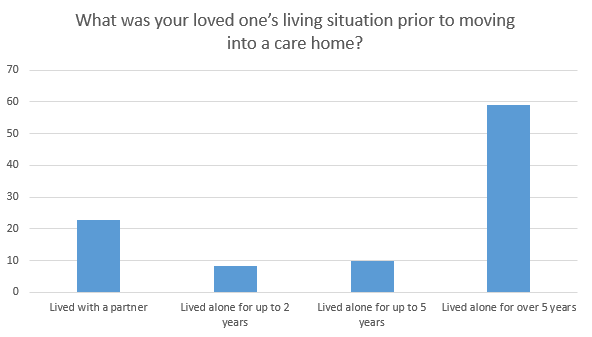 How isolated were people before moving into a care home? 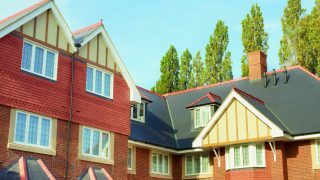 Just 23% of people surveyed reported that their loved one lived with a partner at the point before they moved into a care home. A staggering 59% had been living alone for over 5 years. 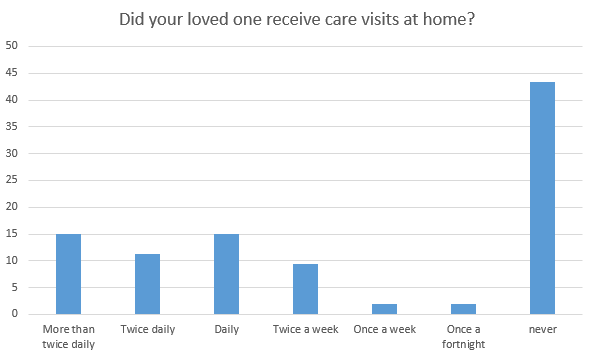 Almost all respondents (93%) reported that their loved ones received visits more than once a week from friends and family. Half of respondents also reported regular visits from carers twice a week or more, with 15% needing a carer more than twice a day. On the other hand, 43% were not visited by carers, suggesting they did not have as complex care needs, however this also means they were more likely to only be in contact with a handful of people, increasing the likelihood of social isolation. 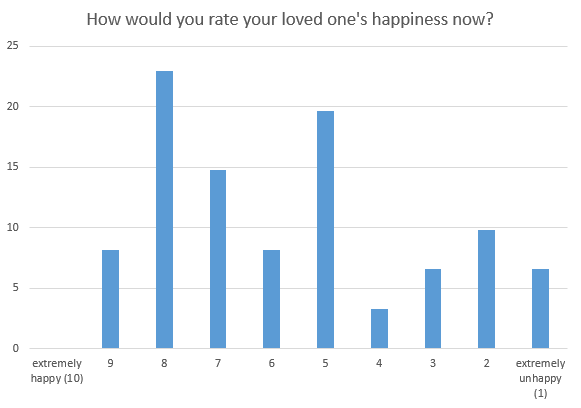 Next, we asked respondents to rate the happiness of their loved ones, where 10 is extremely happy and 1 is extremely unhappy. 49% were rated as unhappy (rated as a 4 or lower), while 37% were happy (6 or above). Once residents had moved into a care home, respondents reported their social activity and happiness increased. We saw an increase in the amount of social activity that residents took part in. 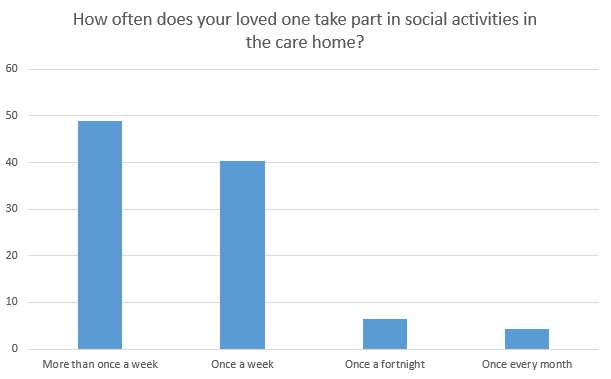 48% took part in two or more social activities per week, compared to 29% prior to moving into a care home. Similarly, after moving in, 89% took part in social activities at least once a week, compared to 63% prior to moving. Similarly, we saw an increase in the number of residents who were regarded as having a higher level of social activity. 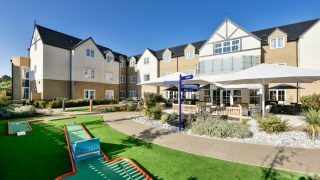 Prior to moving into a care home, just 23% of residents were regarded as having an active social life (10-6 out of 10). After moving in, this figure shot up to 47%. 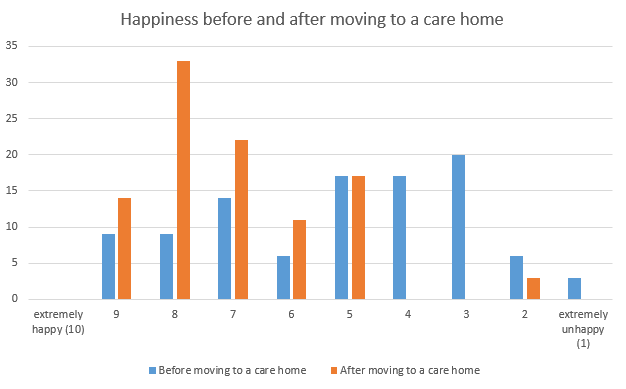 Respondents then rated their loved one’s happiness now that they were in a care home. The number of residents reported as unhappy dropped from 49% to 27%, with 54% being reported as happy and 20% in the middle. 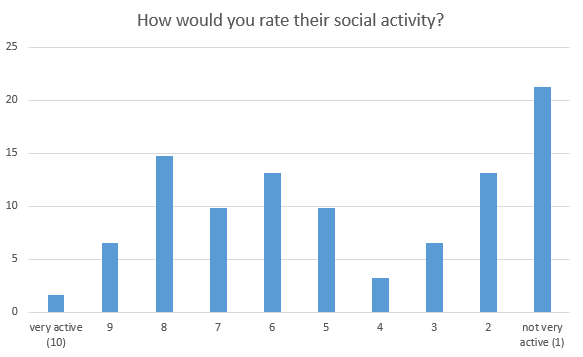 The results show that care home residents are able to take part in more social activities, which has results in a drop in the number of residents being reported as unhappy, with the majority of the responses (66%) falling between a rating of 5 and 8. We can also see what effect taking part in more social activity has on happiness. 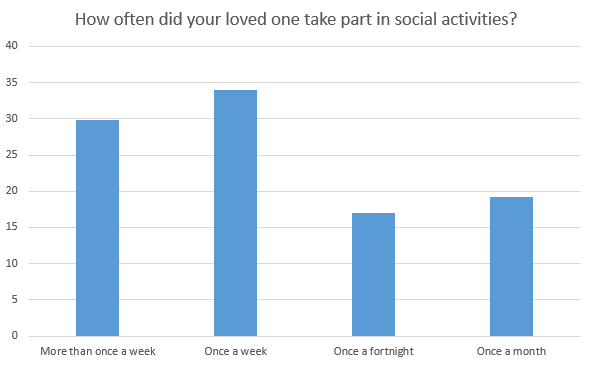 The graph below isolates the responses who reported an increase in social activity, which excludes those who were unable to take part in social activity for example due to frailty or illness. Here, we can see a large increase in the number of people reported as happy after moving into a care home, compared to before. How do these results compare with other studies? These characteristics play a major part in the experiences of residents who were a part of our survey. 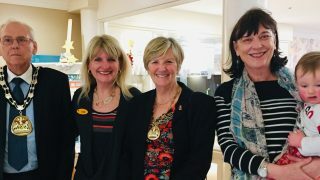 That’s because the care homes they moved to all have a relationship centred care approach, which is a personalised and collaborative approach of forming and maintaining relationships between residents and their carers. As a result, residents are more involved in social activities, explaining the increases in happiness found in our survey, as well as an increase in participation in social activities thanks to a comprehensive social calendar at each care home. Similarly, research also reports that activities that enable older people to be involved in planning, developing and delivering activities are the most likely to be effective in reducing social isolation. 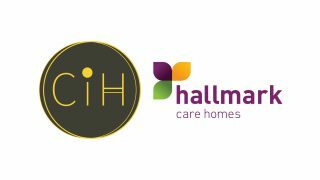 This again reflects the approach of relationship centred care used at Hallmark Care Homes, where residents are encouraged to stay active and independent, for example through the Farmhouse Kitchen Project, which sees residents take part in preparing food at the home. 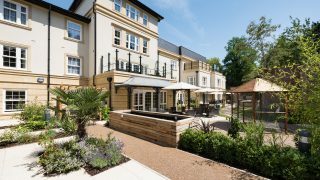 The results show that moving to a care home has a clear positive effect on reducing social isolation through the increased range of activities for residents on offer, allowing greater opportunities to interact with others. Comparing the survey results with other similar studies shows that they types of activities available at the care homes makes a big difference too. 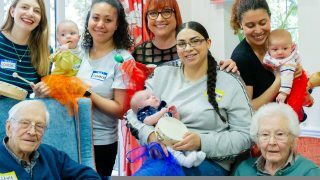 Relationship-centred care plays an important role, as residents must be actively involved in social activity to see the greatest improvement in happiness and avoiding social isolation. Avnish Goyal, managing director for Hallmark Care Homes and chair of Care England said: “It is widely recognised that social isolation is a growing issue among older people. This is a problem which is likely to develop as time goes by given our aging population and the constraints on the social care budget. If you’re worried your loved one is suffering from social isolation, then get in touch now and see how we can help.